If you have ever been tested for glaucoma, I’m guessing that it wasn’t an especially pleasant experience. Tonometry, the procedure that eye care professionals administer, determines the fluid pressure inside the eye. That often involves sending a puff of air directly onto the surface of the eye. 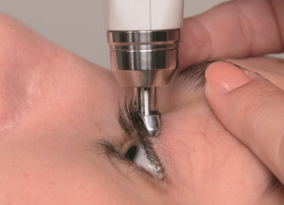 The new Diaton tonometer from BiCOM Inc. can measure intraocular pressure (IOP) without any direct contact with the eye. The Diaton is a pen-shaped device that works through a patient’s eyelid and sclera. And, unlike some other test methods, the Diaton allows patients to keep their contact lenses in place. Diaton also does not require anesthesia drops or sterilization and there is no risk of infecting or scratching the cornea. BiCOM says Diaton results are typically more accurate than conventional tests and its portability means it can be used by family doctors and emergency rooms as well as medical professions who are examining large groups of people. For more details, visit the Diaton website and check the feed @tonometer on Twitter.